The Options view provides access to many useful settings to configure the way in which My Family Tree functions to your personal preferences. Fig 1. The Options view. Number of recent files: the number of recent files to display in the file menu. Open files on the person selected when the file was last saved: choose to load the person selected in the tree at the point the last save took place. If this is unchecked, the primary person selected in the Properties dialog will be displayed by default. 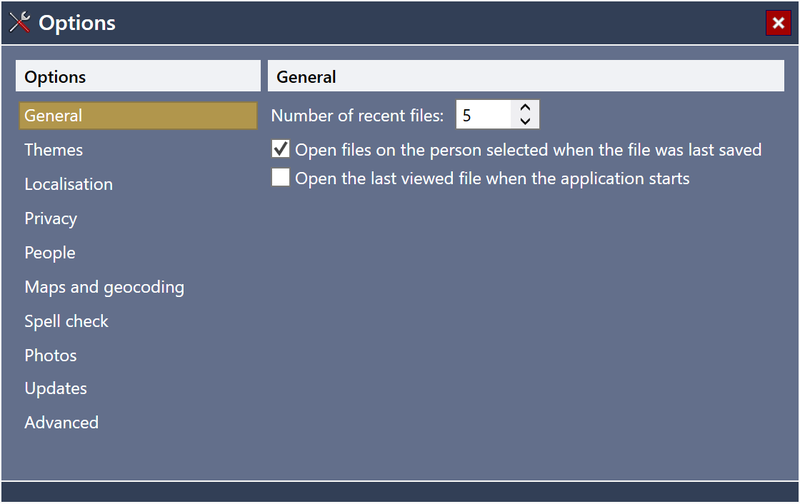 Open the last viewed file when the application starts: choose to load the most recent file when the application starts. Current theme: My Family Tree supports 7 different themes for the user interface. Colour filter: My Family Tree supports colour filters which are designed to make it easier for people with colour vision deficiency to differentiate between colours such as red and green, or make it easier for people with light sensitivity to use the application. Zoom: make text and other items in My Family Tree bigger by choosing one of the zoom options. Font: Choose the font used to display test in the application. Show summary panel: used display or hide the family tree title and family crest in the main window. Adjust ClearType text: If the fonts in My Family Tree are difficult to read, you may need to adjust the ClearType text settings on your computer. See here for more details. Display language: If additional languages for My Family Tree are installed using the My Family Tree Language Pack, you can change the default display language for the application. If you would like to translate My Family Tree in to your own language, please contact us. Date display calendar: choose the calendar format for displaying dates. By default My Family Tree displays all dates in the Gregorian calendar format. The date dispay format can be customised when displaying Gregorian dates. Display dates in their input calendar: overrides the 'Date display calendar' and displays each date in the format it was entered. Default date input calendar: choose the default date input calendar for new dates. Default date type: choose default date type for all new dates. Use abbreviated month names: use abbreviated month names. Use Romanised month names: use the Romanised forms of month names. Use alternative CE/BCE era names: use the CE/BCE era names for the Gregorian/Julian/Sewdish/Icelandic calendars. Hide living people: Hides living people from print outs. See Privacy. Hide private information people: Hides private information from print outs. See Privacy. Do you want to use these settings each time? Specify whether to make the above selections the default privacy options for printing. Life expectancy: the default life expectancy of people in the family. When creating a new relationship, this is used to predict whether the person should be marked as living or deceased. Name display formats: choose how My Family Tree displays first names, short names, long names, and full names. Optionally use a custom name display format. See Names. Display surnames in capital letters: display surnames in capital letters. Display surnames first: displays surnames before other name parts. Enable maps and geocoding: enable the map viewer to use the internet. Search area: the country to search when geocoding place names. Number of search results: the number of place suggestions to display when geocoding. Dictionary: the language of the spell checking dictionary. By default, My Family Tree supports all major versions of English, French, German and Spanish. Check spelling as you type: automatically checks spelling as you type text into My Family Tree. This option is only available for English, French, Spanish and German language dictionaries. Spelling reform: sets the spelling reform mode. This option is only available for French and German language dictionaries. Ignore words beginning with a capital: ignores words beginning with a capital letter during a global spell check. Ignore words with mixed case: ignores words with both upper and lower case letters during a global spell check. Ignore words with all capitals: ignores words with all capital letters during a global spell check. Ignore words with numbers: ignores words which contain numbers during a global spell check. Ignore single letters: ignores single letters during a global spell check. Ignore fields expected to contain proper nouns: ignores fields which are expected to contain names of places. Custom dictionary: edit the list of words which should be omitted from spell checking. Enable photo file compression: automatically compresses a copy of a photo when you first add it to the file. Photos larger than 1920×1080 px are scaled down using the same format as the original image. If the scaled down file is smaller than the original file size, this smaller copy is used instead. Enable LDS support: enables you to enable editing of LDS data fields imported from GEDCOM files. Enable auto-update check: enable or disable the automatic check for application updates. Revert all settings to default: reset all My Family Tree settings to their default values.